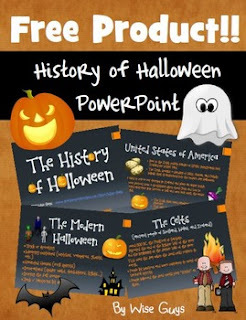 This is a FREE 7 slide presentation about the history of Halloween. I'm sure many of you wonder why Halloween is celebrated. These slides will give you background information back to 800 BC and the Celts all the way up to the modern era in the United States. Students will enjoy learning the history behind one of their favorite holidays! Click Here for Our October Halloween Reading Log!